Challis, Clare Elizabeth 2015. ‘The piano is not tuned’: music in two films by Kira Muratova. Studies in Russian and Soviet Cinema, Vol. 9, Issue. 1, p. 40. Reynolds, Anne‐Marie 2001. Carl Nielsen unmasked: Art and popular musical styles inMaskarade. Journal of Musicological Research, Vol. 20, Issue. 4, p. 325. After the death of Mahler in 1911 the great Austro-German symphonic line was carried on mainly in England, America, Scandinavia and Russia. 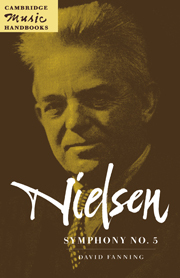 The Fifth Symphony of Carl Nielsen, Denmark's greatest composer, was composed in 1921–2. David Fanning discusses its place within the symphonic tradition since Beethoven, revealing the personal background to the work and taking full account of the extensive Danish commentaries, including the composer's own, which are given in English for the first time. In an absorbing analysis of the music he lays bare the origins of its images of inertia, anxiety and collapse in Nielsen's tone poems and incidental music for the theatre. Insights are offered into the symphony's 'progressive tonality' and its relationship to traditional structural models.